I’m pretty confident this is, and will remain, the youngest thing to appear in my 150. It’s so new, in fact, that it wasn’t even complete when I began this blog. Finishing touches were not added to the redeveloped entrance to Green Park station until a few days before the start of London 2012. I know this for sure, as I walked through it every morning on my way to work. Those were the best of times, with jovial publicity kiosks, swaggering zil lanes and a thousand magenta signs everywhere you turned. 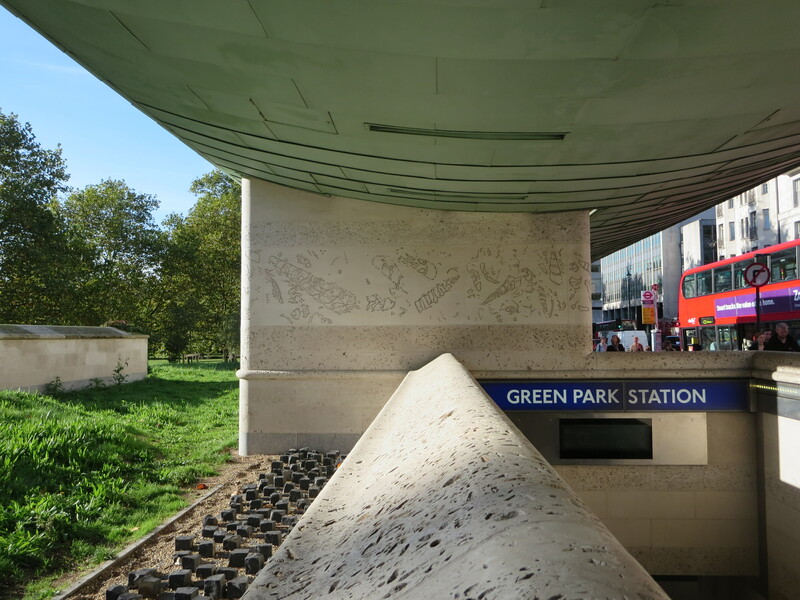 Green Park was one of the Underground interchanges that had been decreed a top hot spot, or possibly a hot top spot, and which was therefore to be avoided if possible throughout the Games. But this turned out to be an exaggeration, or perhaps more accurately a bit of preemptive back-covering. For Green Park station never once seized up, shut down or bowed out during the whole of London 2012. Its glittering makeover had been concluded with the kind of timing of which Chris Hoy would be proud. 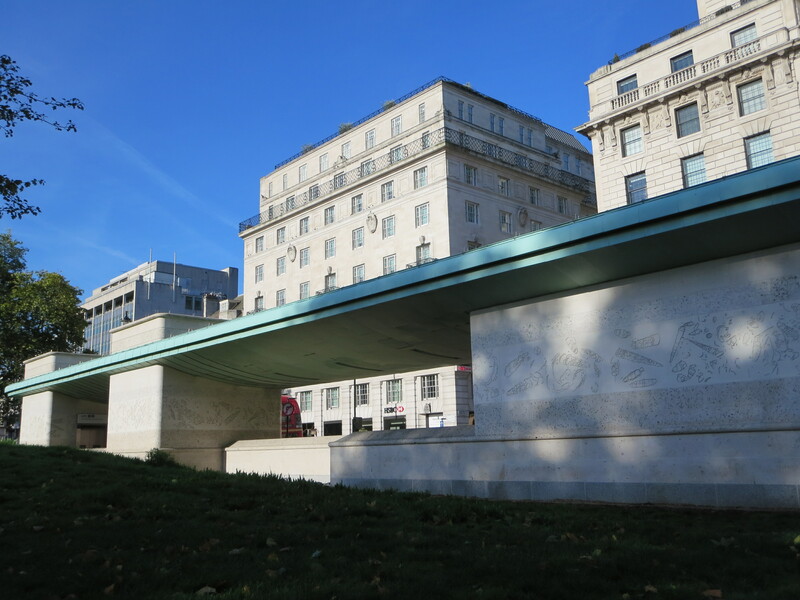 You cannot go wrong with Portland stone. I’ve yet to encounter any building that does not benefit from a coat of the stuff. I’d probably draw the line at a branch of Burger King, but then I’ve already drawn so many lines at Burger King I doubt I’d be able to even see through them for a glimpse of any cladding. 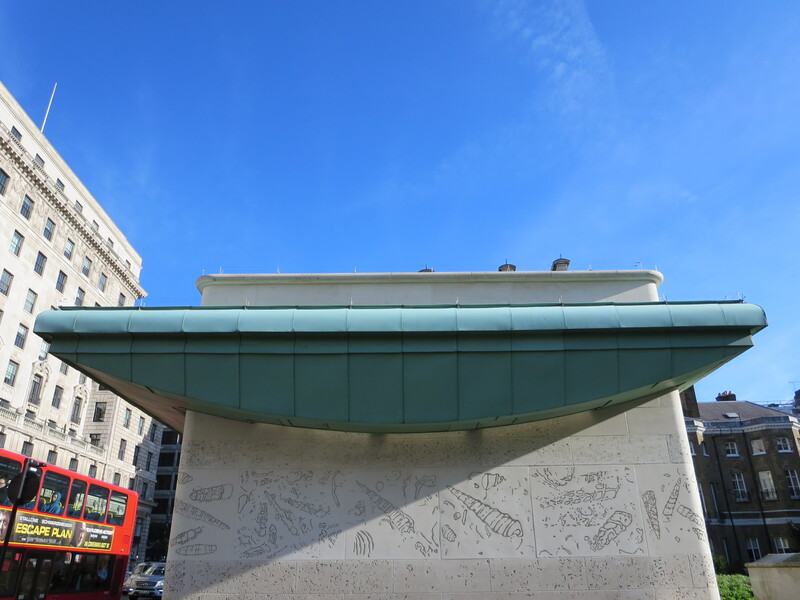 Green Park’s brand new cloak of Portland was turned over to the sculptor John Maine, who created a stunning tapestry of asymmetrical shapes that feel like they are gliding serenely around the whole exterior of the station. The passing resemblance to fossils is deliberate. 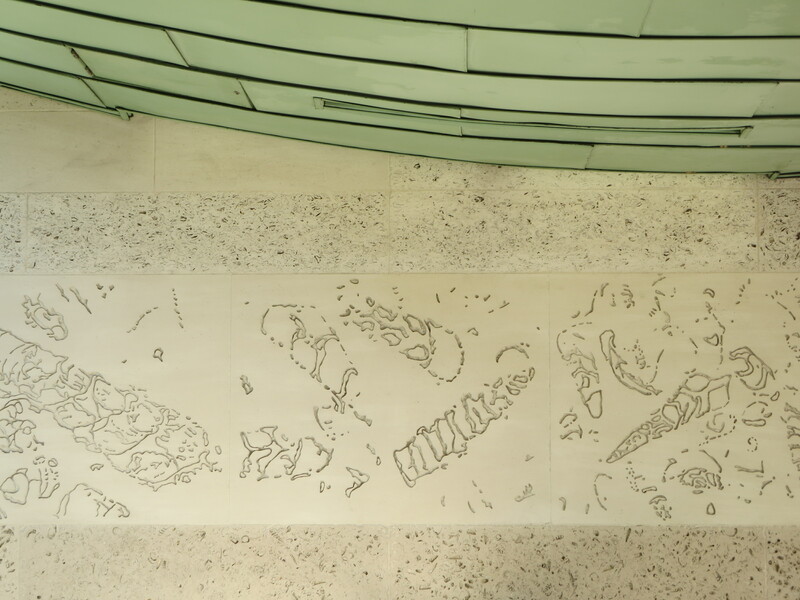 The sculptures go by the collective name Sea Strata, and are intended to both call attention to the material in which they have been created, and to the natural world represented by the location with which the station shares its name. I think the artist succeeds more with the former than the latter, but then I’m a sucker for a bit of infrastructure that wears its heart on its sleeve. Especially Portland sleeves. There are very few Underground stations that seem to want you to touch its walls. Here, the hundreds of undulating patterns and textures positively invite a bit of hands-on exploration. I’ve never seen so many crannies on public view. What you’ll find inside them is another matter – usually rotting leaf matter, if experience is anything to go by. But at least the sculptures are being noticed. I can’t imagine they competed well against the somewhat more over-stated offerings of London 2012. Now that’s all over, however, the faux fossils can go on doing what real fossils always do best. Existing.